View 2015 Award Photos here. Like most downtown buildings, the Edward Jones building was in great need of a facelift. In May of 2014, Jason Helniak applied for a $1,000 façade grant given by Amory Main Street. He and local artist John Ward, came fully equipped with sketches and a description of how successful his renovation would be. The board approved, and neighboring building owners became very interested in upgrading their properties, too. The entire building was painted with detailing around the windows, and finished off with a freshly painted sign and mural including Amory’s unique Railroad heritage done by local artist, John Ward. Jason and his assistant have been instrumental in helping other owners to not only update and restore their buildings, but also educate them on how the Main Street Association can financially assist them in their efforts. The final Façade Grant was nominated to a neighboring building owner and will be completed by July of 2015. Historic and cultural resources are integral to Mississippi’s tourism economy. This award recognizes the project that raises awareness of Mississippi’s cultural heritage assets and preserves and promotes those resources through sustainable tourism. This project endeavored to restore the historic home of Amzie Moore, a prominent civil rights leader in the Mississippi Delta often referred to as a "civil rights giant", to provide and interpretive museum and save the building and historic fabric for generations to come. The home was the site of many civil rights meetings and visitors include Fannie Lou Hamer, Bob Moses, Medger Evers, Stokley Carmichael, Thurgood Marshall and Dr. Martin Luther King. In 2013 Carmen and Chet Oguz purchased the building they would later rename Studio 230 and began a massive renovation project in order to restore the building to its original glory. They were able to not only save the building but also improve it to become a truly unique staple for downtown Cleveland. Studio 230 was built in 1933 and was originally a dry cleaning business. The Oguz family used a Warehouse Chic theme while meeting the Secretary of the Interior’s Standards for Rehabilitation. They exposed windows that had been bricked in, replaced hardwood flooring, exposed the original rafters, reclaimed wood that was original to the building to produce carved wood doors, bathroom vanities, support columns and more. The building currently serves as an art gallery, art studio, and private event space. As with any true landmark location, such as the Crystal Grill in downtown Greenwood, there is really no need for glamorous signage. People have been flocking to the corner of Carrollton and Lamar for almost a century to savor flavors of one of the MS Delta’s dining beacons despite the run down façade, faded sign and woeful exterior. All that changed in 2013 when the Crystal Grill underwent a façade renovation as part of Main Street Greenwood’s Carrollton/Johnson Revitalization Program. As part of this renovation, a piece of the Crystal Grill’s past was brought back to life when Alan Hammons re-created the restaurant’s original sign. With help from Ainsworth Signs and William Sign Company the “new” sign now sits on the corner of Carrollton and Lamar welcoming hungry visitors with glowing neon into the Crystal Grill, into downtown, and into a living piece of MS Delta history. Placemaking and the Main Street movement are closely aligned. Placemaking tools emphasize the need to foster Main Streets as inviting public places that encourage people not only to shop but also to gather as a community. This award recognizes a project that demonstrates the integration of Main Street and Placemaking. Bike Biloxi, an initiative first introduced in 2011, has evolved into a monthly bike ride that promotes and enhances Downtown Biloxi and has improved the downtown area by being a catalyst for the recent addition of bike lanes in downtown. This addition has stimulated the downtown economy while showcasing Downtown Biloxi’s city parks; increasing knowledge of downtown historic sites; increasing revenue and awareness of downtown eateries and an increase in biking enthusiasm in the City of Biloxi. Bike Biloxi has contributed to the improvement of city streets by making biking AND pedestrian traffic more accessible and visible. In 2005, Hurricane Katrina devastated the Gulf Coast. All physical attributes of Gulfport’s beachfront downtown were destroyed or wiped away. The City of Gulfport regarded this as an opportunity to come back bigger and better. In 2007, Mississippi Main Street Association garnered a Resource Team to guide Gulfport in their downtown recovery efforts. One of their “big idea” recommendations was a sweeping streetscape plan. The plan was divided into three phases and would take a decade to implement. The results are awe-inspiring. The palm tree lined boulevards, which many Gulportians remember as children, are back. Custom street lamps light the night. Beautiful rows of sea oats and other indigenous flora line the highway, boulevard and side streets. The visual impact created has helped establish a walkable downtown that is both business and family friendly Once again, people line the streets of downtown Gulfport and businesses vie for locations. A tradition of public service runs deep in Billy Hewes’ family. He is a direct descendent of the first mayor of Gulfport, Finley B. Hewes, and his father also served on the Gulfport City Council. For generations, his family has enjoyed a history of community support and civic involvement. Elected to public service in 1992, Billy Hewes represented the interests of South Mississippi in the Mississippi Senate for 20 years, serving as president pro tempore in his last term. He has served as national chairman of the American Legislative Exchange Council and the Gulf States Marine Fisheries Commission, chairman of the Senate Ports and Marine Resources Committee, Highways and Transportation Committee, and Mississippi National Guard Legislative Caucus. As Mayor of Gulfport, Billy Hewes has a deep-seated love for his hometown. His vision for the future is a vibrant city where people work, live, and play, and a beautiful city that is a true gateway to the Mississippi Gulf Coast. The New York Times called them “derelict.” The four collapsing buildings with five dead storefronts were in the middle of town and despite widespread renovation going on, it was hard to say there was a true downtown renaissance while these sat dead. The end building’s roof had internally an only the turkey buzzard flock that roosted on the jagged joists thought that was good. Still there was hope; a new downtown historic district in 2012 listed the buildings as eligible for historic tax credits and when the owner died in 2013 his heirs quickly sold the building to Kagan Coughlin and Alexe van Beuren. So 8 days after Kagan buys the building and starts work in November 2013, Preservation Magazine shows up, but it took more than 8 days for Kagan and his dedicated crew to bring back 20,000 square feet: A solid year of wiring, plumbing, masonry, roofing, carpentry, painting, welding, and just plain fabricating to bring the bricks, glass, wood, and metal back into living shape as 8 apartments and 5 retail spaces. The Blu-Buck Mercantile Buildings, named for the former owner’s family store, are back on line and no one is saying downtown is derelict anymore. Granted to the downtown organization that has created and implemented the best retention and/or business recruitment program for its downtown. 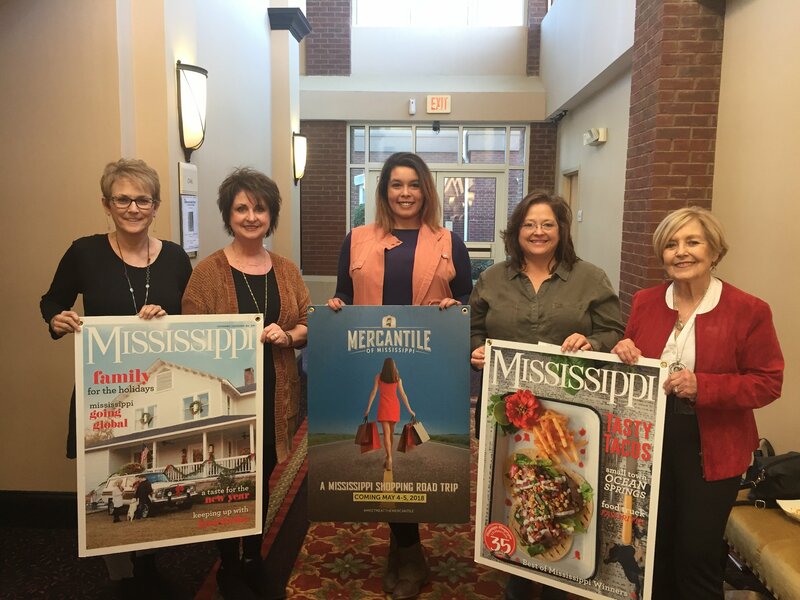 The Bricks to Clicks program was a joint project between Main Street Clinton, the Clinton Chamber of Commerce, and the Mississippi State University Extension Service. This program welcomed business owners in Clinton, both online and brick and mortar, to take part in a series of educational sessions on maximizing online presence. Dr. James Barnes and Chance McDavid, both of the Mississippi State Extension Service, taught participants to optimize websites and social media pages for the most effective marketing and e-commerce results. Awarded to an individual or business that has undertaken a new development project within a downtown district. The project should not only achieve financial success and quality design, but also have a positive impact on downtown revitalization. The Belhaven Building is a $100 million, mixed-use building located in the Greater Belhaven Neighborhood. This 180,000 square-foot development houses medical offices, retail spaces, restaurants and townhouses that wrap around a parking garage. It is a modern multi-story complex linked to the existing hospital building via a sleek sky bridge. Residential townhouses and store\fronts flank two sides, integrating the building with the historic neighborhood. Approximately 325 employees work in the building and 1,300 people visit the building every day. If dedication to downtown revitalization was measured by height, the metric would incredibly wrong when it comes to measuring Carolyn McAdams’ dedication to downtown Greenwood. Although she stands just under 5’, Carolyn’s impact on downtown Greenwood cannot even be measured. Since taking office in 2008, Carolyn has allocated over $10 million into projects to revitalize downtown. Under her administration, Carolyn has over seen downtown entry modifications, streetscape improvements on both Main Street and Howard Street, the establishment of a downtown linear park, and ensured that the public works department has downtown spotless every morning through litter removal and street sweeping. Carolyn’s commitment to Greenwood’s Main Street program is most remarkable, as she makes sure the city supports all endeavors of the program through both city staff and financial support. For Carolyn McAdams, downtown revitalization is the priority and Greenwood has flourished because of her leadership in this priority. Touch A Truck was an event produced from the combined effort of Laurel Main Street, Laurel Friends of the Library, and Laurel Junior Auxiliary. It gathered trucks of all shapes, sizes and functions in one place to allow children an educational means of learning about the vehicles. The purpose of the event was to raise funds to repaint the mural on the side of the Laurel-Jones County Library. Once the funds were raised, Erin Napier’s design was approved, and the mural is being painted. The City of Laurel also contributed heavily to this event with vehicles, police participation, and setup. Restaurant Week was started in 2014 by Keep Cleveland Boring as a way to encourage diners to eat out during a traditionally slow time. In its first year, four restaurants added special menu items for one week only. This year, Team Cleveland Main Street partnered with KCB to help expand the event to sixteen restaurants. We decided to give diners an additional incentive for eating out by adding a fundraising component. We selected three items that were suggested by our Master Planning Charrette: bike lanes, improvements to Firemen’s Park, and wayfinding signage. These items were put on a ballot, each time a diner ordered something off of the restaurant’s special menu, they could vote for their favorite project. In turn, restaurants agreed to donate $1 from each special item sold back to the Chamber to help fund the winning project, the Chamber agreed to match the total amount raised. In 2005, historic downtown Gulfport was looking a bit worn and outdated, and then on August 29, 2005, Hurricane Katrina came through and battered the already bruised district. To address years of neglect and Katrina’s physical devastation, a partnership was created between the City of Gulfport, the 501c3 Gulfport Main Street Association and dozens of private property owners to repair, restore and renovate over 80 building façades. A Master Façade Grant Program was created and implemented. Funded by the City of Gulfport through CDBG recovery dollars and overseen by the Gulfport Main Street Association, the result has been prodigious. Since the completion of this program there have been more than 40 new businesses opened in downtown and over $300,000,000 in private and additional public investment in the district. Gulfport Main Street’s Master Façade Grant Program has been the catalyst ushering downtown Gulfport into a new Golden Age. Buddy Montgomery has been a leading force for the Main Street Program in Pontotoc County. He is the president of the local First National Bank with offices in Pontotoc and Ecru. His leadership has guided our program from the first talks in 1993 to the beginning of our program in 2007 until the present. Mr. Montgomery has personally led the cry for a Main Street with not only his talents, but financial backing by paying our dues to the State Main Street Association. His commitment to our program is very clear in his support of projects, such as the no interest façade grants for local businesses and our annual Bodock Festival. His dedication to the preservation of our Main Street Areas in our County is unmatched. Pontotoc County Main Street Association is thankful to nominate a very deserving individual that has been instrumental in making our program strong. New South Weekends is a marketing campaign focused on Downtown Friday night events, prior to Saturday home football games. The purpose of the campaign is to collectively promote a series of events and dining/shopping opportunities, while branding Starkville as Mississippi’s College Town. This award recognizes excellence in communication by a downtown organization through its newsletter. Jessie Gurner’s idea was to get the word out about the new Main Street program in Water Valley so she approached David Howell, new owner of the 120-year-old North Mississippi Herald weekly newspaper. Her idea was to write a regular column in the paper serving as the newsletter for the nascent Water Valley Main Street Association. Howell agreed that anything that would help downtown, his readers and the Valley’s local business advertisers would be beneficial to his paper. The deal was 500 plus words a week with the NMH adding a snappy headline and an image, but the text couldn’t be a cut and paste job from outside sources, it had to be compelling, strictly local, and timely writing. Jessie named the column Street Talk and it has been the job of every WVMSA director since to write it. To date that is 397 columns, about 208,425 words. Or the equivalent of 3 books. Retail Therapy Thursday was a simple idea from a local merchant who approached Carthage Main Street wanting to do something to boost retail sales for her business. It blossomed into a four-month promotion that included 17 businesses that stayed open an extra two hours on the first Thursday of the month from September to December. The idea of Retail Therapy Thursday was to promote business and to showcase the different shops that Carthage has to offer. The problem that we had to overcome was that our merchants are not all centrally located. They are spread out all over town. The way we overcame that issue was that each month we bought a full page add in the newspaper that listed their monthly specials and each merchant got a live 5 minute remote from the local radio station to promote the business. On January 8, 2015 on one of the coldest days in South Mississippi, the Ocean Springs Chamber of Commerce/Main Street/Tourism Bureau created a “Snow Day” in Downtown with real snow to let children experience snow for the first time, making some of the most wonderful memories for families throughout the Mississippi Gulf Coast. The children enjoyed the “Snow Day” with the “official cutting of the Frozen Cake” followed by greetings from Olaf, a life-size snowman. The Facebook reach for the event was far beyond a normal cold day reach on Ocean Springs, with an organic reach of more than 26,000. A recent graduate of the Mississippi College School of Law, David began his involvement with Main Street Clinton by joining the Promotions Committee in 2014. His creative ideas and infectious energy were an incredible asset to the committee, and his enthusiasm and commitment to the Main Street approach made him an obvious candidate for a board member. David joined the Board of Directors in 2015 and is now the co-chairman for the Promotions Committee. He championed the Olde Towne After Dark event, taking the lead in putting the committee’s ideas into action. He was instrumental in the creation of the event and promotes it heavily through social media. David serves as the emcee of OTAD; his dynamic personality and camaraderie with participants are what continue to draw crowds. A faithful volunteer, David has made tremendous impact on the Main Street Clinton program and embodies the Spirit of Main Street. Andrea Miham is the highly successful owner of Laurel’s Southern Antique Mall. The store welcomes patrons from all over the state and the entire Southeast. Her business model is unique in that it encourages the formation of spinoff businesses. She rents out spaces to vendors who eventually can start their own stores, passionately believing that this model produces new businesses, for that is how she started. She has beautifully renovated her building with help from a Laurel Main Street Façade Grant, and seeks to make Laurel not only a viable, thriving business market but also a beautiful place to live. Due to the commitment, time and enthusiasm that Paul Coggin brought to the Mississippi Main Street Association, a special award was established in his honor, given to an outstanding local board member or volunteer who has been active in a downtown organization for at least the last two years, and who has contributed energy and dedication to downtown revitalization. Michelle Coats was part of the original Pascagoula Main Street Board and on the Economic Restructuring committee when the organization was designated as a Main Street community in March of 2000, and then unanimously voted as Board President. Michelle and her husband spent numerous hours completing the paperwork for Pascagoula Main Street to separate from the City of Pascagoula and to receive 501c3 status. She was also instrumental in the organization’s move to its current location in Anchor Square retail shopping village, is a wife and mother of four, and a member of Pascagoula Rotary and many other civic organizations. Mayor Jimmy Cockroft sees the benefit of the Main Street Program for our historic Square. Under his direction, benches and new lighting has been placed on the Square, the historic Strand Theater façade was refurbished and the Strand marquee is lit as well as the streetlights framing the historic Court Square. Mayor Cockroft patiently answers my questions and guides me on the right path in my endeavors as Main Street director. The Mayor along with the City Board of Aldermen has embraced the Community Charrette and helped get the County Board of Supervisors approval to participate in the Charrette so we can enter into new and creative ideas to promote Kosciusko. Virgi Lindsay has skillfully and graciously directed the Greater Belhaven Neighborhood Foundation since its inception. The Foundation is a 501©3 charged with long-range planning for the historic Belhaven and Belhaven Heights neighborhoods and commercial areas, and was designated a Mississippi Urban Main Street community in 2003. The Historic Belhaven and Belhaven Heights neighborhoods were both officially listed on the National Register as local historic districts in 2012, which makes it the largest historic designation in the state. With the guidance of visionary leaders on her board and executive committee as well as support from city leaders like Councilwoman Margaret Barrett Simon, Virgi has brought many goals and projects to fruition during her tenure. In 2005, Greater Belhaven became Jackson’s first neighborhood to rezone as a mixed-use district along Fortification Street. In 2012, the Fortification Street Project – a $15.5 million project - finally got underway, resizing the thoroughfare from four to three lanes with 5-foot-wide sidewalks and new water and sewer lines. More utility work and the installation of decorative lighting is ongoing. Since the reopening of Fortification Street, local businesses have invested hundreds of thousands of dollars in building improvements, created 30 new jobs and seen an increase in pre-road construction revenue. Through the Being Belhaven Arts Series, the Foundation presents programs of music, theatre and art in the beautifully restored and award-winning Belhaven Park on Poplar Boulevard, to bring people to the neighborhood and promote Belhaven business and the historic districts. The series includes Bright Lights, Belhaven Nights, an annual street festival which draws more than 5,000 festival-goers and celebrated its 10th anniversary last year. Virgi and her board host a major fundraiser annually for contributors to Being Belhaven and Belhaven 100 that raises nearly $100,000 for operating funds. Everything the Foundation does is accomplished through raising money and in-kind donations from the community at large. Belhaven’s thriving partnership with Baptist Health Systems played a key role in the design and master plan of The Belhaven, a new mixed-use, medical office complex that opened in the summer of 2013. The Belhaven sits on one of six blocks owned by Baptist across North State Street from its main campus. Through new zoning, implemented by the Greater Belhaven Urban Main Street Program and the City of Jackson, the 180,000 square-foot, $100 million development includes offices, retail and residences. Virgi was named Top Business Woman for Community Service by the Mississippi Commission on the Status of Women in 2013, and Greater Belhaven was named one of America's 10 Great Neighborhoods in 2014 by the American Planning Association as part of its Great Places Awards program. To say Virgi has been busy as the leader of Belhaven for the past 14 years is quite the understatement. She has blazed the trail for other neighborhood associations and Urban Main Street programs in Mississippi. She puts all her passion, time and energy into the ongoing development of a unique and desirable community-driven neighborhood, and all of these achievements mentioned merely hint at the hard work, endurance and character of this great lady. Her efforts and investment have not only benefited the Belhaven neighborhood but also strengthened the Jackson community as a whole. Mississippi Main Street is proud to recognize Virgi Lindsay, the leading lady and “star” of the Greater Belhaven Neighborhood Foundation, as our 2015 Charles Beasley Scholarship recipient and Outstanding Main Street Manager of the Year. Congratulations, Virgi!